With flowers so large that you need two hands to cup a blossom, the tree peony in the garden of Christine Brooks provides a spectacular spring show. “Isn’t it beautiful?” she asked as I admired the tree with her this past weekend. 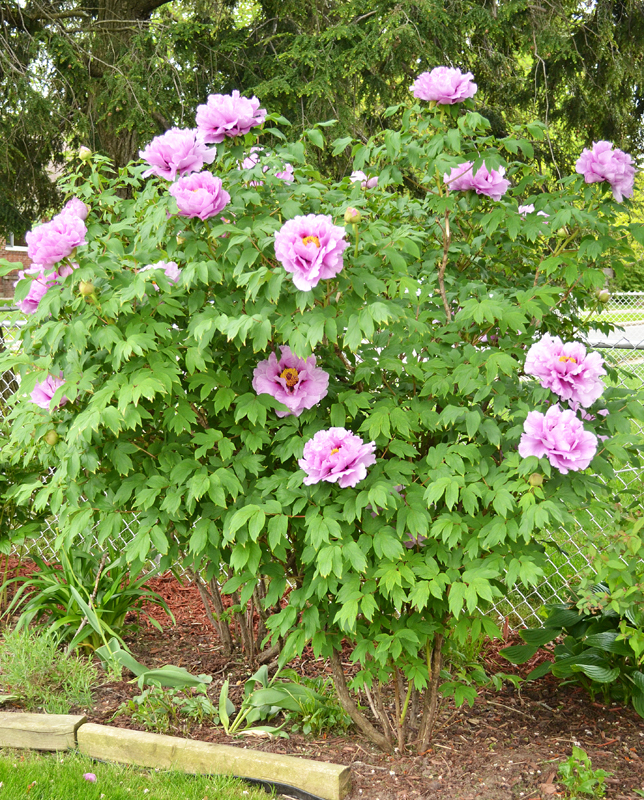 The tree peony is visible from the street as you drive toward her home at 22 Larchmont in the University area of Buffalo. It’s in the side garden along the driveway. It blooms two weeks at the most, she said, and it may be finishing within days. The tree bloomed early this year because of our strange spring weather; it doesn’t usually bloom until Memorial Day. Also early this year is the Tree Peony Festival of Flowers. The festival was moved up due to the early spring weather and will continue 9 a.m. to 5 p.m. Saturday and Sunday, May 19 & 20 and Saturday, Sunday and Monday, May 26, 27 & 28. The festival is held at Linwood Gardens, 1912 York Rd., Pavilion, NY 14525 (35 miles southwest of Rochester). The historic gardens feature a distinguished collection of tree peonies. Linwood Gardens is listed on the National and the New York State Register of Historic Places. 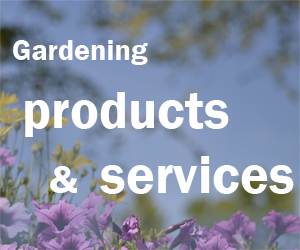 Linwood Gardens is a not-for-profit organization. The suggested contribution for the festival is $8 to be used for garden preservation. A guided tour is $10. Linwood Gardens is a private residence and open to the public only for the Tree Peony Festival of Flowers, Summer Workshops, and the Open Garden Day participants. Brooks said her tree peony started to bloom in its fourth year, and it took seven or eight years to reach its full size. It’s about 12 years old now. “It needs lots of water throughout the year to keep the plant healthy,” she said. The tree peony needs to be trimmed back in the spring before it blooms. When the flower fades, it leaves behind a hard shell that needs to be cut off, she explained. 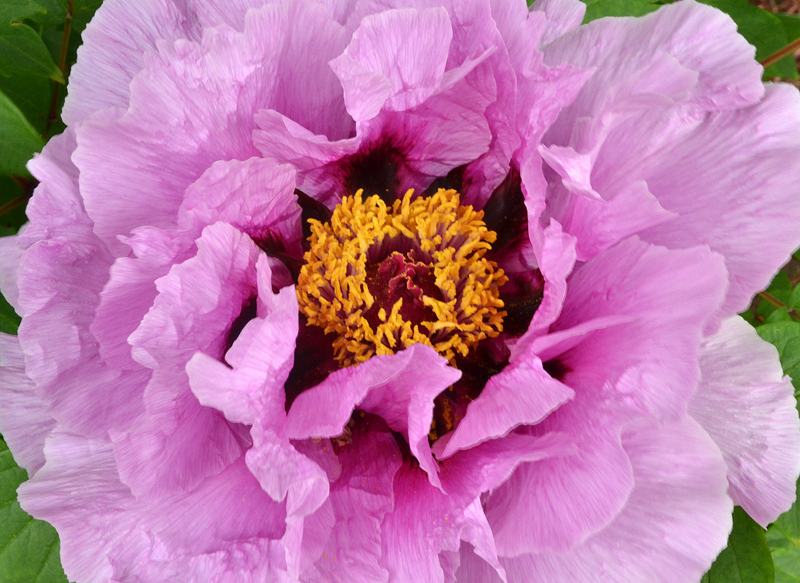 While it is a showpiece, the tree peony isn’t the only attraction in Brooks’ landscape. The front of Brooks’ house has a welcoming entranceway surrounded by gracious curving gardens that are brimming with plants. Some are already blooming while others are waiting for their turn in the coming weeks and months. “Something’s always blooming,” she said. Even the plants that aren’t blooming now provide interest through their textures and leaf colors, which are various shades of green and silver. Her front gardens include primrose, Sweet William, pinks, lady’s mantle, hydrangeas, wormwood, roses that bloom all summer and something she called a turtle plant that will get purple flowers. Sage, the herb, provides a patch of pretty groundcover. While it can be used in cooking, Brooks said she occasionally burns it in the house to scent the air. 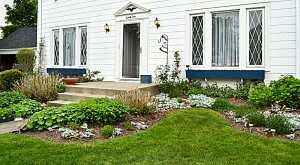 The medians in the street are also planted with perennials and are maintained by Brooks and her neighbors. There are gardens along Brooks’ driveway, and a sidewalk from the driveway leads to a cozy backyard retreat, which you can see above. 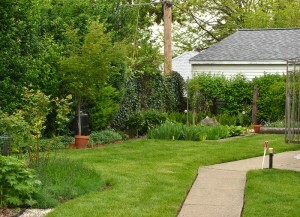 Vines and tall bushes, including a very fragrant mock orange, give the space privacy. In the summer, Brooks sets up a canopy to make the spot feel even more secluded. The water feature in the backyard, seen at right, was just installed in March. 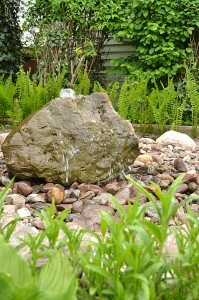 She got the idea after seeing a similar fountain on one of the garden walks last summer. Nearby is a rose whose petals are very dark purple at the tips and transition to almost black at the center. “I try not to spend an awful lot of money,” she said. 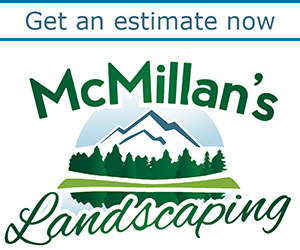 As perennials spread, she would split them up and move them to other parts of her yard. “At one time, the squirrels did it for me,” Brooks said with a laugh, “so I had plants coming up in strange places and I had to move them back. Brooks said she didn’t start out with a grand plan for her landscape and sees what she has as just normal perennial gardens. She just carved out spaces for her gardens and developed them over the years. why do my peonys bush have lots of ants on them and how do i get rid of them? I’m not sure. If someone knows the answer, I hope they will respond here. If we don’t get any answers here, I’ll post your question in an article next week and see if we can find someone who knows the answer. Hi Deborah, don’t have a answer for you, my trees do not have ants, however, my regular peonies do. I have always had ants all over the regular peony plant buds. They never harmed the flower. Maybe they help to open the flower. I’ve had them for 30 years at least. Just got my first tree peony last year and my second one this year. peonies often have ants because thye exude a sweet fluid to attract them. Ants are pollinators for peonies. Contrary to popular belief, ants do not help open the flower.